eBay UK is running a promotion to encourage buyers and sellers to engage with its charitable giving programs. The eBay for Charity Competition will award PayPal credits to winners along with donations to their favorite charitable organizations. 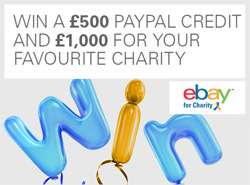 UK sellers earn a chance to win when they list an item in support of a charity, and UK buyers earn a chance to win when they add a donation to charity when they buy an item. eBay has a searchable database of almost 8,000 charitable organizations on the eBay UK website. eBay UK will select five winners in a random drawing after the end of the promotion from among all eligible entries received - the prize draw is limited to one entry per eBay user ID during the promotion. The contest is limited to residents of the United Kingdom who are 18 years of age or older and who are registered members of www.ebay.co.uk. In addition, PayPal Giving Fund will award 1,000 pounds each to the charities chosen by the winners from among any UK registered charity. In order to receive the deposit, the charity must also be registered as a member of PayPal Giving Fund, which administers eBay for Charity. If a charity is not a member of PayPal Giving Fund upon prize notification, they have fourteen days from notification date to register in order to receive the deposit. eBay said users have raised more than 50 million pounds for 7,800 UK charities by buying and selling through eBay for Charity since 2006. The promotion runs September 1 - 30, 2013, see full details and terms on the eBay UK promotion page.